Perfect competition with a subsidy, algebra review - FreeEconHelp.com, Learning Economics... Solved! In a competitive industry each firm has total costs C = q^2 + 16. Demand is D = 80 – 5P. A $4 per-unit subsidy is introduced for this good. 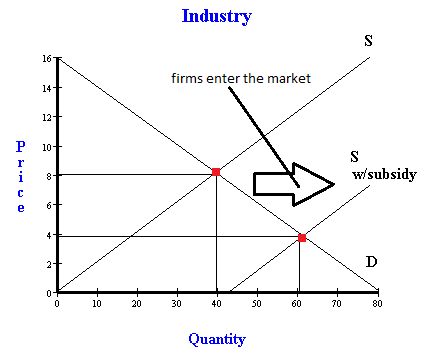 Provide a pair of fully labeled diagrams showing “The Firm” and “The Industry” to outline the response to this subsidy. 1) Solve for the perfectly competitive output level by setting marginal cost equal to average total cost. This gives us the minimum of ATC, which is the long run equilibrium output for a perfectly competitive market (at the firm level). 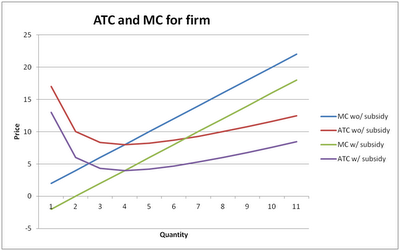 2) Use this output quantity to solve for ATC and therefore price (price = ATC = zero economic profit). Use this price to find quantity demanded using the market demand function. 3) Figure out what market demand will be, and divide this number by the optimal output per firm to find the number of firms that will produce in this market. 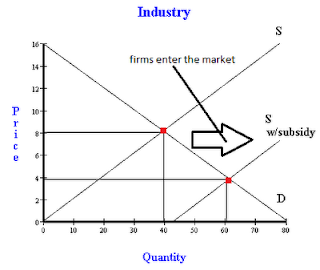 4) Since the subsidy is per unit, you can subtract the subsidy from the price, and resolve for quantity demanded, firms will enter the market to increase the quantity produced. This can seem like a tricky question, but is actually straight forward if you know how to approach it. First we know that this is a competitive industry, so we know that firms can enter or exit the market as they wish. This means that in the long run, firms will be producing at the minimum of their average total cost (ATC) to ensure that there is zero economic profit. We can find the minimum of the ATC quite easily by finding equations for both the ATC and the marginal cost (MC) and setting them equal to each other and solving for quantity (q). This works because MC crosses ATC at its minimum. 2q (by use of the power rule, the exponent drops down and becomes the coefficient and the 16 drops out). 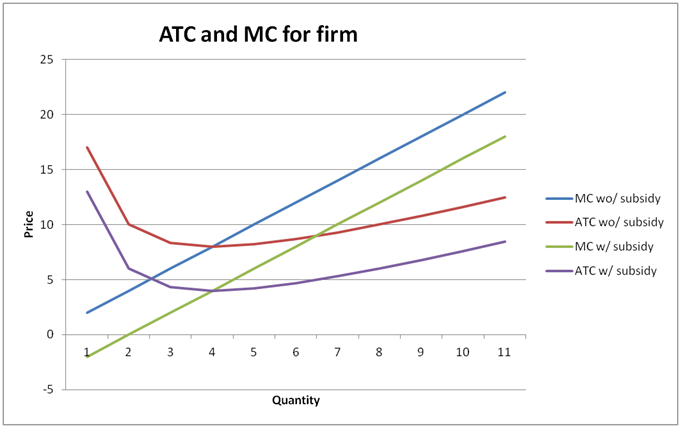 You can see from the graph, that in both cases, the MC crosses the ATC curve at a quantity of 4, but the price will change. ATC = q + 16/q = 4 + 16/4 = 4 + 4 = 8. D = 80 – 5P = 80 – 5*8 = 80 – 40 = 40. So 40 units will be demanded and if each firm produces 4 units, we will need 10 firms. So without the subsidy we have a price of $8 and ten firms each producing 4 units. D = 80 – 5P = 8 – 5*4 = 80 – 20 = 60. So if every firm produces at their minimum ATC (a requirement in long run perfectly competitive markets) then we will need 15 firms (60/4). 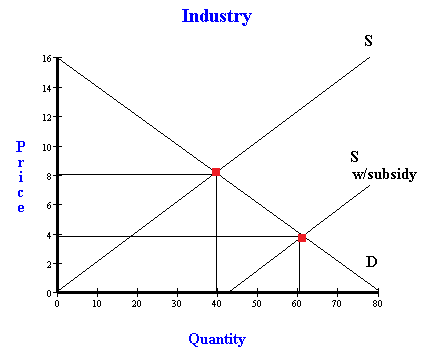 This will shift the supply curve to the right (an increase in supply) because there are more suppliers. The new equilibrium will occur at a higher quantity and a lower price.